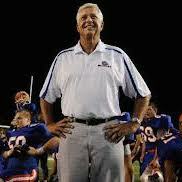 Charles “Corky” Rogers has amassed more high school football victories than any other coach in Florida. His 423-72-1 career record places him in the top 20 active coaches and top 50 all-time nationally. A graduate of Robert E. Lee High School in Jacksonville, where he was a three sport-star playing on the 1960 mythical state champion football team and 1961 state baseball championship team. He played for Bobby Dodd at Georgia Tech and briefly for Don Shula with the Baltimore Colts. He coached at Lee and won 10 straight district titles from 1977-86. He took over at The Bolles School in 1989 and has won seven state titles with two runner up finishes. Among Florida coaches with more than 300 wins, Rogers is the only coach with fewer than 100 losses.